DNP is the world's largest manufacturer of dye-sub printing materials. DNP carries a broad selection of solutions for the photo retail market and products designed to address retailers’, event photographers’ and photo booth operators’ specific business goals and objectives. The U.S. group, DNP Imagingcomm America Corporation, is based in South Carolina. The company’s chief mission is to make digital photography easy, convenient, and fun for consumers by providing retailers, professional and event photographers with tools necessary to realize this goal. Pursuit of this goal has helped DNP solidify their position as a leader in retail and event photo printing solutions. The DS40 produces high quality, brilliant full color photos in 2-2x6, 4x6, 5x7 and 6x8 print sizes. The DS80 produces 8x10 and 8x12 print sizes with incredible print quality and resolution. Newly designed compact printer is ideal for Photo Booth applications. The DS620A features an enhanced thermal print head and print engine system for years of trust performance. The DS80DX provides a versatile range of simplex and duplex printing options for creating high quality printed photos, photobooks, calendars, and greeting cards in-store and on-site. The SnapLab+ SL620A is a compact kiosk system, combining a DS620A printer, an order terminal called a DS-Tmini, and DiLand software -- no computer needed! Our dye-sublimation compact kiosk system is the easy winning formula to turbo charge your photo business now! 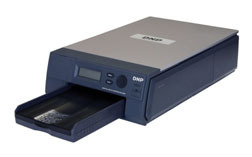 Save when you Bundle the DNP DS-RX1HS Photo Printer and Darkroom Core. Custom packing box to ship a DNP DS620 Printer.